Home » Branding » How Deep is the Hole Your Brand is In? How Deep is the Hole Your Brand is In? 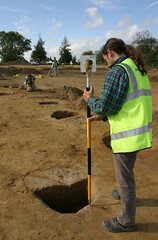 Originally uploaded by Wessex Archaeology. Interbrand’s Brand Marketer’s Report for 2007 has been released and makes for some interesting reading. You can download your own copy here. Interestingly, "consistency" is seen to be the most important aspect of successful branding. This made me think. It made me wonder. It made me realise that there are many brands and brand managers out there digging themselves a very large hole. If consistency is one of the most important aspects of branding, then how is your brand going to withstand the forces of co-creation? How will you and your organisation cope with the ravages of consumer generated content? What will you do about blogs? YouTube? Flickr? I am all for consistency — but consistency of story ranks high for me. Get that right and your brand is safe in the hands of your consumers. Hmmmm…interesting. But what do you mean about co-creation? And what do you mean when you talk about consistency of story? Gavin: Great post. Wow. Thanks for the link as well. I’d love to know more about how you build towards a consistency of story in the brands you work with. It’s something we are struggling with on this side of the pond. We’ve been taking a build the idea of co-creation into our brand strategy direction but don’t have any solid tools for doing such yet.